Two-thirds of NHS and private hospitals failed to meet the highest standards of cleanliness in a snapshot survey, it has been revealed. The Healthcare Commission sent unannounced "hit squads" into 98 hospitals in England this summer. Inspectors found mental health hospitals had particularly poor cleanliness standards. The Department of Health said it would work with the commission and other agencies to help failing hospitals. Until now, patient surveys and planned inspections by patient groups have been the main sources of information on cleanliness. However, in these spot-checks inspectors went to 37 NHS acute hospitals, 33 NHS mental health and community hospitals, 11 independent acute hospitals and 17 independent mental health hospitals. Many had been identified in the past as failing to meet cleanliness standards. They looked at medical equipment, beds, sinks, bedpans and toilets. The inspectors also looked at outpatient departments, and - if appropriate - A&E departments to check for spillages, blood, general stains, debris and dust. One hospital was not included in the results as it is disputing its score. 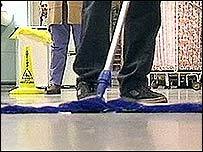 They found a third of the hospitals visited achieved the highest standards in cleanliness across the board. While 33 hospitals met the highest standards (classed as band one), 43 were classed as having "room for improvement". Avon and Wiltshire Mental Health Partnership NHS Trust, which runs the worst ranked hospital has apologised to patients and carers. Barrow Hospital received a ranking of 36% from the Healthcare Commission. In a statement the trust said: "The conditions reported by the Healthcare Commission are clearly unacceptable and we recognise that we should take all reasonable steps to improve conditions for service users and for staff. " IT said "state of the art" replacement facilities were currently being built. Evidence of systemic problems was found in the worst performing 22 hospitals, indicating that cleanliness was unsatisfactory for an environment where clinical care was provided. But all six worst-performing organisations were mental health hospitals in the NHS or independent sector. Whether or not "in-house" cleaning teams were used made no difference to cleanliness standards, the commission found. Fears have been raised in the past that using outside companies was more likely to mean lower standards. Instead, the crucial factor was whether the cleaning teams were effectively managed and working in partnership with other staff. Those hospitals failing to meet the highest standards will now be given action plans to help them improve. Cleanliness spot-checks will also form part of the new annual health assessments planned for NHS organisations. Simon Gillespie, head of operations at the Healthcare Commission, told the BBC: "There were some excellent results in the NHS and independent sector. "But there were too many organisations with unacceptable levels of cleanliness, predominantly in mental health facilities which is particularly distressing." He added: "I wouldn't want to go to one of these worst hospitals. "The bottom line is walking into an organisation and your feet sticking to the floor because it hasn't been cleaned adequately, smelling the toilets some way before you can see them, urinals encrusted with limescale and urine is really pretty horrible." Chris Beasley, chief nursing officer for England, Chris Beasley, told the BBC Today programme only a small number of hospitals were poor, but the situation was still "totally unacceptable". "It's just as important for people who have severe mental health problems to have a clean and comfortable environment as it is with somebody who is going to have open heart surgery." Dr Paul Grime, chair of the British Medical Association's occupational health committee, said: "Too many of these hospitals are falling short. It is particularly worrying that, despite patients' concerns high numbers of hospitals have not set up robust cleaning systems. "And the fact that some mental health hospitals have seriously poor levels of cleanliness paints a disturbing picture." Health Minister Jane Kennedy said: "We recently announced £130m capital funding specifically to update mental health environments and will be announcing further work on enhancing the environment soon." She said the department would work with the commission and other bodies to rectify poor standards where they had been found. Shadow Health Secretary Andrew Lansley said: "Every hospital should achieve the highest level of cleanliness. Despite countless government initiatives, standards remain unacceptably low." And Liberal Democrat health spokesman Steve Webb said: "This report is a wake-up call to a complacent government that warm words and task forces are not enough to end the scandal of dirty hospitals."